Over the past few months, I’ve had the pleasure of sharing some excellent UDL success stories from our readers (linked at the bottom of this post, in case you missed them). Today I want to put UDL success in the context of a more specific framework, with the help of a great new book on UDL lesson planning. 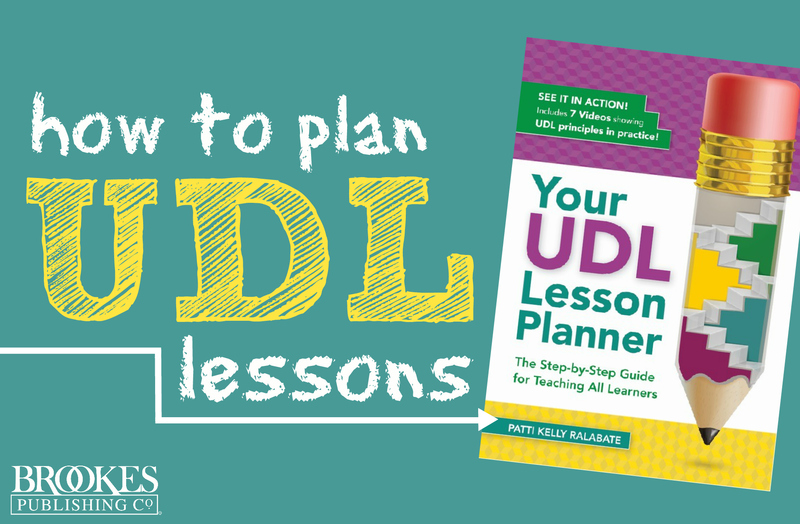 In Your UDL Lesson Planner, Patti Kelly Ralabate outlines six critical steps to UDL lesson planning and explores each one in depth. In today’s post, I’ll give you a brief rundown of these steps to success–and then share three short case studies adapted from the book, so you’ll have a few different concrete examples of how teachers can put this six-step process into practice. 1) Define flexible, clear SMART goals. Ask yourself, “What is the goal of this lesson?” (The CCSS or your state standards will often serve as the base for your goal.) Effective learning goals are SMART: specific, measurable, attainable, results oriented, and time bound. 2) Consider learner variability. Assess the readiness levels, skills, and needs of your learners and the challenges of the learning environment. Anticipate learning gaps and barriers that may distract, frustrate, or confuse learners. Apply UDL guidelines to plan for learner variability and determine what scaffolds are needed. 3) Determine appropriate assessments. Choose assessments that provide meaningful information, are flexible, and assess individual student growth. Find out what assessment accommodations are listed in students’ IEP or 504 plans and provide these during instruction. 4) Select methods, materials, and media. Consider the types of assistance you need to include in order to address learner variability: scaffolds? Supports? Accommodations and modifications? Choose methods, materials, and media that offer flexibility and relevance and balance assistance with challenge. 5) Teach and assess learning. Put it all together and deliver your UDL lesson. Assess student learning with flexible, informative assessments matched to your learning goal. 6) Refine educator learning through self-reflection. Review the data you collected through your assessments and think about your observations. Did your students achieve the learning goal? What worked well? What will you do differently next time? This basic six-step plan will look different for every teacher, depending on grade level, goals, and the specific needs of students in the classroom. Below are three diverse examples of how teachers can put the UDL “success steps” into action. Three students who are English language learners need support in understanding and using basic English vocabulary. Several students are shy, rarely speaking during large group time. Laura is intrigued by UDL and would love to focus on applying it to her lesson planning, but she’s so overwhelmed with the varying needs of her students that it seems like a lot to take on. She wants to go slowly–so to avoid feeling overwhelmed, Laura decides to focus on the UDL Principle of Representation for her next circle time lesson. Laura believes her curriculum should focus primarily on building language and social skills. After reviewing the CCSS, she selects a kindergarten-level English Language Arts Literacy standard and uses it to set a learning goal: Students will listen to a poem (“Rain, Rain, Go Away”). With prompting as needed, through a Q&A and group picture-card exercise, students will recall key details from the poem and answer four out of five who and what questions. Laura’s learning goal is flexible and SMART. It has embedded scaffolding that allows all her students to participate. She designs a reading-readiness lesson focused on recalling information from a short poem. For students who are reading or starting to read, Laura pairs words with visuals to help her students make the decoding connection and build sight vocabulary. To scaffold vocabulary development for the English language learners, Laura includes gestures and facial expressions as she reads the poem. She also pairs ELLs with students who are already reading and can serve as models. For shy students, Laura provides multiple opportunities to respond during partner time and keeps a close eye on them. To keep the attention of students who have difficulty listening in large groups, she moves them close to her and keeps her teacher-talk to a minimum. Laura selects 5 teaching methods for her lesson: direct instruction, mental modeling, Q&A, discussion, and cooperative learning. As she reviews UDL guidelines for the principle of Representation, Laura adds a representation option she hasn’t used before: word cards paired with symbols (e.g., Who, What, Listen, Answer). To clarify vocabulary, sentence structure, and text decoding, she uses a call-and-response technique, physical response (clapping), and photos of students paired with their names. To promote social skills and engagement, she selects a student-to-student Q&A strategy. Laura embeds a simple check for understanding at the beginning of her lesson (“Hold up two fingers”). She uses a skill checklist to keep track of how the students respond to who and what questions during the Q&A and the group picture-card exercise. After planning and implementing this lesson, Laura realizes that she uses a lot of UDL strategies already. This makes embedding them purposefully rather than accidentally a reasonable shift in her thinking. Because all of her students were fully engaged in the lesson with no behavior issues, Laura concludes that UDL is definitely worth doing. Pat is a seventh-grade math teacher whose district requires a lesson plan structure based on backward design (i.e., designing curricula by setting goals before choosing instructional methods and assessment). Pat sees some parallels with UDL and wants to work UDL principles into his existing lesson plan. He discusses it with the chair of the mathematics department, who is intrigued with Pat’s idea. She agrees to let Pat adapt his current lesson plan if he reports on his efforts at a future department meeting. Pat agrees. He opts to focus on incorporating the UDL principle of Action and Expression and on building in multiple opportunities for assessment throughout the lesson. Even though his seventh-grade students are engaged during class, almost half of them failed his end-of-unit test–and Pat believes the scores would improve if students had more practice solving high-interest problems during class. Pat selects a topic of keen interest to his seventh-graders: shopping. His flexible, SMART learning goal is this: Given shopping examples, students will use proportional relationships to solve 10 multistep ratio/percent word problems with 90% accuracy. The students have varied interests, so he creates four different shopping “wish lists” centered around popular student interests: technology, sports equipment, clothes, and music. Eight of his students read below grade level, three of them at a second-grade level. So Pat incorporates multiple visual representations for these learners, pairing text and mathematical notation with pictures. Pat arranges his students in mixed-ability groups, believing this will provide good models for the students with weaker reading skills. He offers students multiple options for producing illustrations of their work, so that students with lower-level writing skills have the scaffolding they need. As Pat selects materials and media for the math lesson, he focuses on offering flexibility, choice, and many different displays of the concept of proportional relationships. Pat shows a brief animated video on sales tax to enhance understanding and sustain student interest. He provides students with multiple representations of the concept, including slides, a math vocabulary word wall, a poster, a spreadsheet of state sales taxes displayed on a U.S. map on a whiteboard, a problem-solving checklist, and a group product planning guide. He offers different media that the students can use to create their final illustrations, such as an array of materials for creating posters and iPads with apps for producing slides or short videos. Pat would like to be more aware of what and how his students are learning so that he can adjust the pacing of his instruction if necessary. Throughout the lesson, Pat adds multiple opportunities to assess what students know. Through strategies like a stand-up quick check, a team work-product illustration, and real-world application exit cards, he checks their knowledge and progress at multiple intervals. 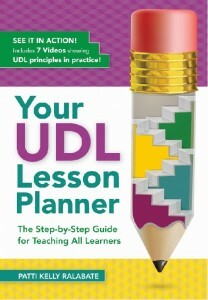 Pat realizes that UDL has been a huge help after implementing this lesson plan. Instead of limiting students to solving a few word problems on worksheets, he can now incorporate flexibility and choice into his lessons. Doing this ensures that his students have meaningful opportunities to practice new content. He’s now able to embed any necessary scaffolds almost invisibly, and he has the daily data he needs to adjust his instruction before students start falling behind. Ninth-grade English teacher Ray has concerns about learner engagement–he’s known as one of the best teachers in the school, but some of his students still don’t participate in class. He wants to change up his lessons because he’s bored with doing the same thing year after year, but he’s not sure what to do first. After a UDL workshop, Ray decides to completely revamp the way he plans his lessons. His main focus is the UDL principle of Engagement. He gathers and studies some sample lessons online for inspiration, and then he gets started with his lesson redesign. Ray reviews the CCSS and develops this SMART goal focused on determining a themes in a text: Students will create a brief musical summary that demonstrates their analysis of connected details and at least two emerging themes in Kurt Vonnegut”˜s Slaughterhouse-Five (measured by music product rubric). In Ray’s classroom, student reading levels span the spectrum. One student with special needs reads at a fourth-grade level, a number of readers are highly gifted, and many fall somewhere in between. Ray incorporates multiple strategies to help all students engage with Vonnegut’s Slaughterhouse-Five and complete the project. For students who need an alternate version of the text, Ray offers an audiobook and a video of Ethan Hawke reading the narrative. Ray highlights big ideas from the text–for example, by adding vocabulary to the word-wall poster of key words from the text. Some students need vocabulary scaffolding, support for information processing, or help organizing their ideas. Ray gives them copies of key text sections, a vocabulary checklist, a product guide, and character and plot charts. Ray also provides a library of CDs and sample music organized by genre. Starts the lesson by highlighting topics that relate to his students’ interests. Asks students to establish personal learning goals and clarifies from the beginning what will happen during the lesson. Builds in background information so no one feels lost or left behind. 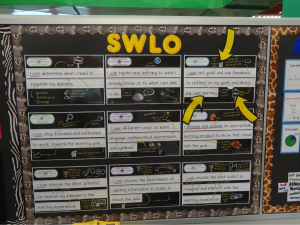 Uses multiple methods to support learner engagement and peer interaction throughout the lesson. Gives learners choices about how they’ll show their knowledge. Closes the lesson with a summary and discussion of what comes next. At the beginning of the lesson, Ray uses a quick thumbs-up/thumbs-down informal assessment. He observes student engagement as he walks around the room while the students are working in groups. Ray develops a Music Product Rubric to assess the final projects. Ray changes his role in the classroom by focusing on the UDL principle of Engagement, and his teaching becomes better for it. He’s no longer standing in front of the class dispensing knowledge–now he’s a true facilitator of learning, moving from group to group and offering suggestions and encouragement. All of his students are engaged in the lesson now, and their learning is deeper and more relevant. 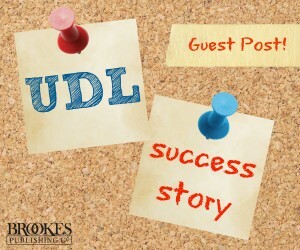 Have a UDL success story to share? Submit yours here! 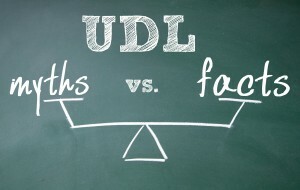 6 UDL Myths (and the Facts Behind Them!) Debunk 6 common UDL misconceptions with this post inspired by Loui Lord Nelson’s Design and Deliver. Includes an awesome infographic to pin and share! 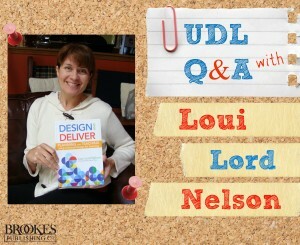 “Start Small”: A UDL Q&A with Loui Lord Nelson. Loui offers valuable real-world tips for getting started with UDL in your classroom. Believing is Seeing and The Little School That Could. 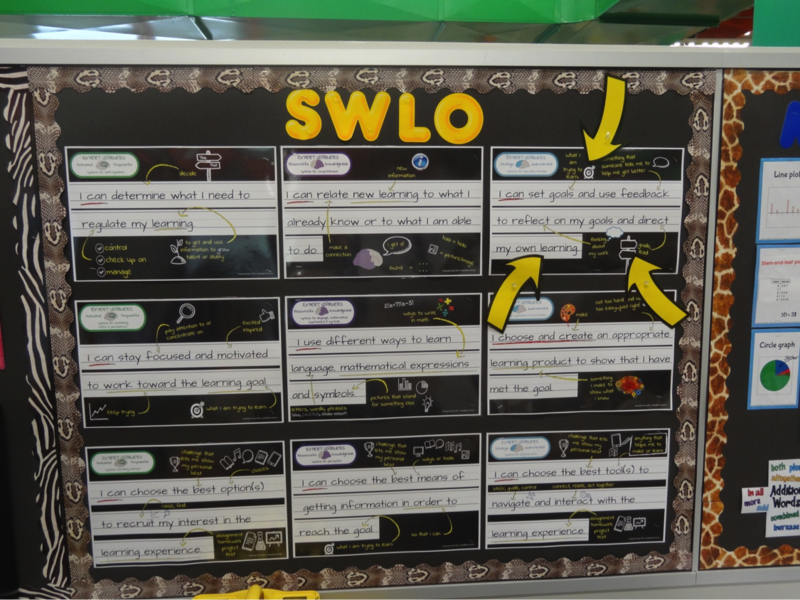 UDL Facilitator Stephanie Craig shares lessons learned from her own success stories in these two fantastic posts (part 3 is coming soon, so stay tuned!). The UDL Investment. Educator Joni Degner tells a memorable story about her personal “aha!” moment with UDL. I think that most teachers would be surprised that they do already implement UDL in their lessons. That is why is would be beneficial to have an open attitude toward UDL because most likely you are already doing it. I really like the different ways for students to respond to questions, even at the middle and high school levels. We sometimes forget that students are intimidated by raising their hand or answering questions out loud. Using hand signals and the stand up assesments etc. encourage more student involvement.